The idea for this is based on a main course I had recently during a rather boozy lunch session at Harts with a very dear friend Zoë. She and I enjoy meeting up in nice restaurants, sinking some vino, gossiping like there’s no tomorrow and talking some shop. I always love our get-togethers and just wish they could be more frequent. I’ve only got into tarragon this last few years, but boy, do I love it and its aniseedy tinged cousins, fennel, pernod and star anise. So, on sampling some delicious tarragon heavy puy lentils over that lunchtime with Zoe I banked the recipe in my mental rolodex for future use. 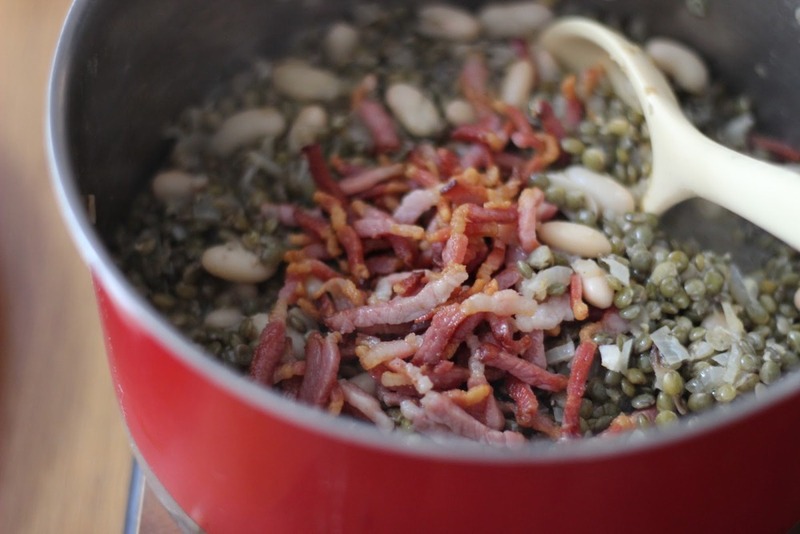 Today I added some firm cannellini beans to the lentils for added texture, along with fine snippets of crispy smoked streaky bacon from my fave butcher (Tony at Wrights in Carrington) for depth. Combined with creme fraiche for richness, lemon juice for clarity and extra virgin for a slinky finish creates a dish component that could sit along side everything from chicken to pork chops to salmon. I entreat you to give it a go. I chose spring greens as I like the dark iron taste and al dente texture they bring, all it needs after wilting in unsalted butter is to finish it off is a little lemon. If you don’t like the greens simply substitute that for either kale, cavalo nero, savoy cabbage or spinach, whichever is your favourite. Add a knob of butter and glug of olive oil to a saucepan on a medium heat, gently cook the onion for around 15 minutes until soft and translucent, then add the garlic and cook for another minute. Add the drained lentils and cannellini beans to the pan no, then add the bacon, wine, a generous grind of black pepper and cover, cook gently on a lowish heat for around 10 minutes, once the flavours have got to know each other a bit taste and add salt as desired – it’s important to not add salt earlier as the bacon (depending on how salty it is) will lend some of that to the dish, so you need to check that first before topping up. Now turn the lentils onto a very low heat and keep the lid on while you cook the fish and greens. Put two frying pans on your hob, turning one on full blast and the other onto a medium heat (the one on the hottest is for the cod, the other for the greens which get cooked later). Add a generous knob of unsalted butter to the hot pans, take your cod fillets and season them with salt and pepper on their skin side, and when the butter is really foaming in the very hot pan add the cod to the pan skin side down – the pan needs to be as hot as can be for that and the butter to crisp the skin, so make sure to wait until the pan is very hot indeed. Cook it without moving the cod like this for four minutes, then season the flesh side with salt and pepper before turning the fish over and knocking the heat down to a medium heat, cook like this for another three minutes. Whilst this is happening, add the juice of half a lemon to the lentils, the crème fraîche, tarragon and a glug of extra virgin olive oil and turn the heat up a little to cook through (no higher than a medium heat so the creme fraiche doesn’t split). Whilst this is happening turn the heat up on the pan for the greens to full blast, add the greens to the butter straight away and let them sit there, move them around a little just to get them wilting. After the cod has had its three minutes turn the heat off and let it sit there for two minutes as the pan cools down – the residual heat will make sure that these super thick cod fillets will be cooked right to their centres. Once the greens have wilted down by about half and are shiny, add a squeeze of lemon juice and remove from the heat, at the same time as taking the lentils off the heat. Plate. 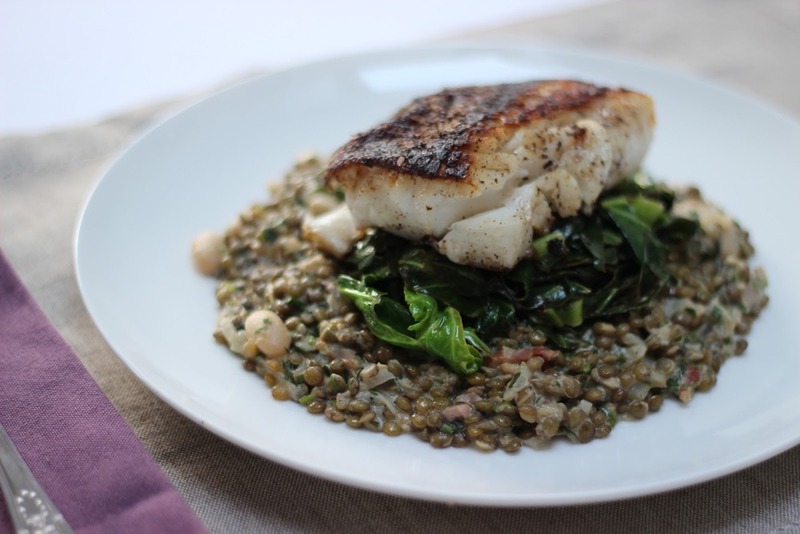 Spoon the lentil mixture onto a plate, followed by the wilted greens, then topped with the crisp skinned cod. Devour, accompanied by a glass of your favourite, naturally.